Mark Ogge's memorable, beautifully realized paintings are both engagements with the world as he directly perceives it and the world as he imagines it and, to a lesser, subtler, yet somehow even more crucial degree, the world as he wishes it would be. These layers of perception and projection, and methodology, interweave and mesh in telling and aesthetically compelling ways, where one informs the other in a dialogue at once calculated and open to chance. His deliciously, devil-may-care, 'retrograde' practice of en plein air sketching, in rapidly and skillfully executed pencil or oils, is really a sleuthing for scenes, a sniffing out or chancing upon given and thus gifted objects and subjects that, as he would put it, 'resonate' on levels other than the merely retinal. Yes, the subject matter they provide gives his work a responsiveness and connection to the seemingly random, haphazard nature of the built and natural world, and in this way, he anchors his work to the 'world out there', which serves as a corrective to the pitfall of self-indulgent private expression and the danger of lapsing into technical formulae. Yet he also knowingly intuits that this seeming randomness is no such thing: that everything he sees has its reason, that the 'manmade' in particular is the realization and materialization of human needs, desires, fears and fantasies. Also, human exploitation. And these embodied, hypostasized common human traits and qualities that he apprehends and seizes on 'out there', are also a way into his own psyche, his own mind, his own humanity. This is the old game, the old wager, of finding the universal in the particular, the archetypal in the personal, but it is a gradually expanding, inclusive loop with new input refreshing and deepening the insights his paintings so powerfully and eloquently give testimony to. His subject matter is characterized by tensions that are the stuff of our dreams and nightmares. He is drawn to images and scenes redolent of our desire that life should be full of wonder and fulfillment and the shattering or depressing realization that it is not, and hints that these very same human longings for something better are all too easy to exploit by the unscrupulous, the powerful, the demagogic or merely the desperate for financial gain and/or political distraction and control. 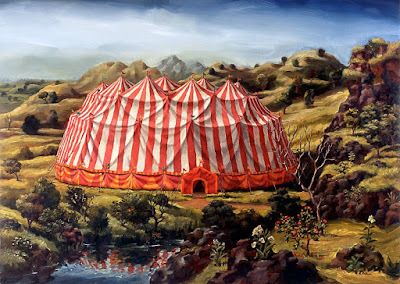 The arena that seems to embody this most acutely for Ogge, the carnival or the Show, as we say in Australia, is happily, and surely not coincidently, a place abundant in visual interest. And he makes hay of the opportunity to paint the flashing, glowing neon lights, the dream-lit, star-struck, enchanted spaces and the bizarre props and enticements on display... all of it crassly commercial, base, tawdry, false if not sordid, for we know the only emperor is the emperor of ice cream. But transubstantiated, transmogrified into deftly yet never showily handled paint, a kind of aesthetic redemption is attempted, and for the most part successfully (we think of Manet's 'Folies de Bergere', an absolutely key painting in our analysis of Ogge's oeuvre (pardon the alliteration, but how could I not?!)). Other themes seem to present this tension in different ways; the false consciousness of community in the glowing anonymity of roadhouses, the nothing-that-glitters-is-gold plastic wonderlands of bargain stores and almost surreal, hallucinatory circus tents, heralds of human longing and child-like anxieties, in landscapes that have evaded human destruction, but for how long? Children are his stand-ins for that part of our nature (his own included, in the sense that every work of art is also necessarily a self-portrait) that will not accept, or yet barely knows, we are born into systems whose byproduct is human misery and privation, and the forlorn, jaded or bored adults those souls (again, also his own and ours) whose light is dimmed by cares, aches, self-abuse, squandered opportunities and lost loves. They are also, of course, real people he has seen. I recognize that Ogge captures the 'truth' of the showground, visually and metaphorically, delivering images that are powerful, iconic and memorable without exaggerating or falsifying his subject matter. And I take it that his real subject is discernible in this tension: his deep, abiding humanity and compassion. These are not paintings that mock or preach, or overstate. They allow the people he masterfully conjures in paint their own presence and way of being in his 'built', ensnaring environment. He does not impose an agenda on them, put them through the hoop or distort their bodies into emblems of human iniquity or pathos, but quietly situates them in a world of enticements that fails to deliver and yet will not be done with the dream, even if it proves ultimately to be moth to flame, body to bonfire and soul to sticky end, come what may. But that hankering for magic and fulfillment (proxy for love, surely? ), is our most precious 'commodity', the living flame that can transform the world into something fit for human dignity and kindness. 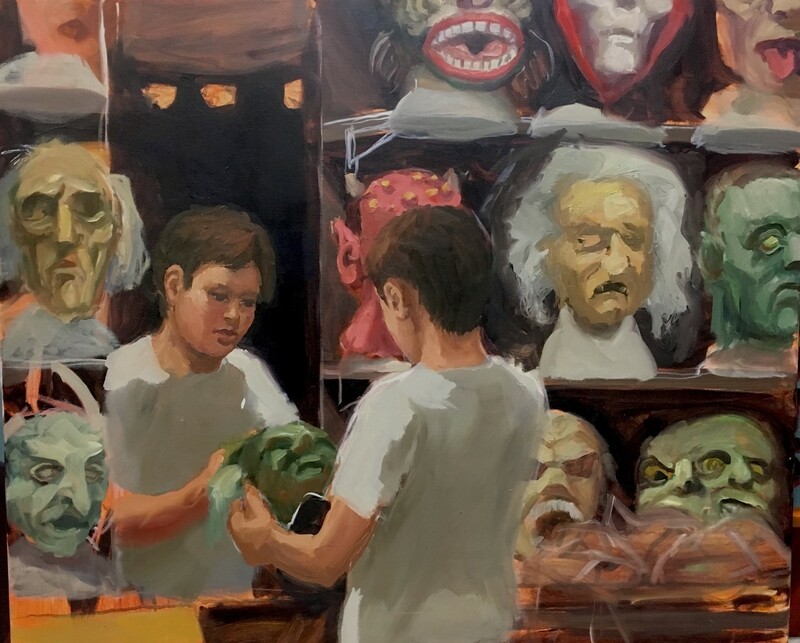 These paintings, then, are an attempt to locate and give form to that, while acknowledging it is also the most assailed and exploited part of our human nature. In their achieved ability to contain so much thematic complexity in a richly compelling aesthetic 'package', of having their critical cake and enticing us to eat it, Mark Ogge's paintings are as good an argument I know for the continued relevance of painting in our spectral, pixel-saturated world of fleeting and flitting digital distractions. The way I learned to paint was by painting and drawing from life. I would go out every day and find subject matter that I liked, and draw and paint it. It might be a tree, a corner of a back yard, an industrial landscape, a service station, a person.....just anything I felt drawn to...that resonated for me. Outdoor painting continues to be an important touchstone of my practice, as it feeds into my more imagined and constructed work. 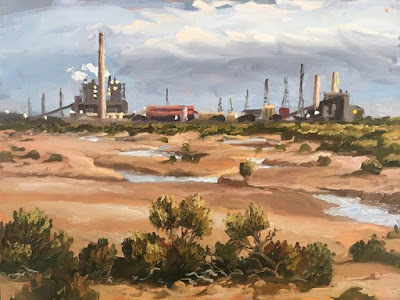 I regularly go out painting and drawing in urban and rural areas. It’s hard to know exactly why any particular subject resonates. But for me, certain images metaphorically trigger psychological feelings, memories, or insights. As with life, the associations and feelings are often complex and subtle. In this picture of the old coal power stations at Port Augusta, In South Australia, I am drawn to the beautiful soft and ancient landscape of the region, but also the pathos of the old power plants. They are symbols of (European) peoples' ambition to exploit the natural world to create power and industry, but have become relics from a passing age. They are both symbols of our ingenuity and our destructiveness, and of the transience of our endeavors contrasted with an ancient and yet vulnerable environment. All of my work is based on studies from life, drawings and paintings. I rarely use photographs. For me the close looking and actual engagement with subject matter is really important. If I draw a tree, or a person, it's like a meditation on the thing, person, or place in front of me, and helps me understand it more deeply, both visually, and in terms of what the subject might mean to me. However I often use these studies as points of departure for studio paintings. 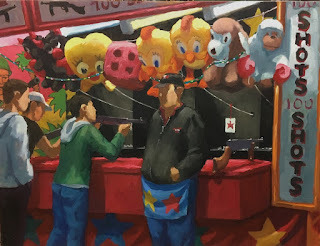 One subject I frequently return to is the fairground, because of its rich metaphoric and visual significance to me. My main memory of fairgrounds from childhood was a moment at the Royal Melbourne Show, an annual agricultural fair in Melbourne, that has rural displays, but also fairground stalls and rides. I remember distinctly when everything had seemed magical and infinite, and then suddenly the magic dropped away and I saw it as somehow shabby and immensely lonely. I'm not sure if my perception was changed by some other event or anxiety in my life at the time, or whether it was a moment of actual insight, but either way it was a powerful experience for me. To me this experience is emblematic of an aspect of our way of seeing the world. As children we are gripped by wonder, everything is magical, then as adults we shift to a more knowing perception, seeing the shabbiness, crassness, monotony. But we are still capable of experiencing intense engagement and wonder...often we shift between the two. My work aims to recapture the sense of wonder that a child can experience...but also the ordinariness behind it. 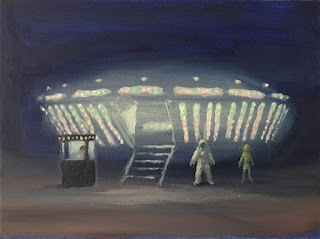 Take the painting of the Gravitron as an example. The Gravitron is an actual fairground ride in Australia. On one level, for the child, the Gravitron is a wondrous apparition, full of excitement and mystery...space travel, aliens, the promise of some extraordinary experience once we walk up the ramp and enter. But we also know that the ride cannot fulfill this... and the bored woman in the ticked box hints at the underlying ordinariness... yet to the child, the ticket booth itself is a glowing portal to transcendent experience. Layered over that is the metaphoric associations of the thing itself, suggesting the optimism of space travel, but also the fear of the unknown... aliens! It's comic, but it's also somehow deeply symbolic of our aspirations and fears. Fairground imagery is often powerful and full of symbolism. To attract people, it needs to tap into people’s desires and/or fears. Think of the ghost trains and haunted houses as archetypal images of fear and death, or the river caves creating exotic wonderlands of places we would love to visit. And then of course there is the artificiality. When we go to a fairground we are surrounded by an entirely artificial environment. Everything is plastic, steel, paint, lights and amplified, canned sound. And in that sense, it's a metaphor for how we have transformed the natural world into an artificial wonderland. This results in excitement, spectacle, and illusion of plenty, but also a deep nostalgia. The artificial world we inhabit creates a deep anxiety and sense of loss for the natural world, even if these feelings are on a largely unconscious level. For me the fairground is a metaphor for this... like the world in miniature. People in artificial environments are a recurring theme. Restaurants, bargain shops, roadhouses… like fairgrounds, these brightly lit spaces are instances of the natural environment transformed into a plastic, glass and steel wonderland, wonderfully enticing and actually amazing in a way, but also deeply alienating. The shooting gallery is a common fairground attraction. Boys shooting targets for prizes, the harshness and violence of the weapons and the war scenes painted on the tin sidings, contrasted with the cute soft toy prizes, a strange but somehow poignant pantomime of male conditioning and psychology. It's also a reflection on age and stages of life. The boys are completely taken up in the excitement of the shooting, with the man completely removed from it, stripped of any illusion...for him it's a way to earn a living... but not so long ago he was a boy engrossed in the adventure himself. For me, while painting is a means of reflecting on and contemplating life, and a way of expressing something meaningful, the meaning of a painting is in a sense the starting point only. Having an idea or concept for an artwork is something you either have, or don’t. The real work is in taking the idea and crafting something aesthetically powerful. For me this has to be done in reference to the great art from the Western tradition I work in. Earlier this year I was lucky enough to attend a talk by Kerry James Marshall, for me, definitely one of the best living artists in the world today. Asked why he looked to the "canon" of Western art for inspiration rather than rejecting it and looking to a "black" tradition, he said that he had a moment of understanding when visiting the Uffizi. Surrounded by Quattrocento Italian paintings, be realized that some were great images, and others were not. The Giottos and Botticellis were clearly far superior to many of the paintings around them. He said at that moment he realized that there were things that made one painting better than another, the craft of aesthetics (my words), and that he needed to learn from these artists to understand those things in order to make the powerful work he wanted to make. This is something that I believe all artists have to come to terms with in their own way, deriving inspiration and knowledge form the tradition of art they work in to find ways to realize their own vision and experience.